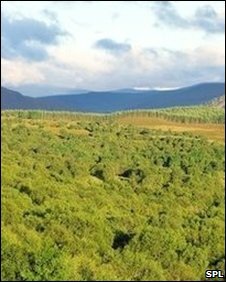 A consultation period is closing on plans to lease the management of up to 25% of the Forestry Commission's Scottish woodlands to private firms. The Scottish Government believes the move could raise up to £200m to help reverse the effects of global warming. However, it has generated significant opposition from politicians, trades unions and some forest users. Environment Minister Mike Russell said he would "consider carefully" all views expressed during the consultation. The proposals are part of the government's Climate Change Bill. They could see up to 40% of the Forestry Commission's estate in Dumfries and Galloway and the Borders being leased and up to 60% in Argyll. Mr Russell said it was important such an option was considered. "Climate change is the biggest threat facing the planet," he said. "It is right that we explore new and innovative ways to make our national forests work harder to reduce the impact that climate change has on us all." He dismissed the claims of some opponents to the scheme as "nonsense and scaremongering". However, Malcolm Crosbie - of the Forestry Commission Trade Unions - insisted the lease plan was a "very poor option". "It is a one-off payment and once it's gone the lease for 75 years is, in effect, a permanent move out of the public sector." He said the proposals could have an impact on about 300 people employed in the forestry industry. Alan Marshall, who organises the Merrick Rally in Galloway each year, said he remained concerned about the proposals. He said the motor sport event brought a much-needed tourist boost which could be lost. "At the moment we have got no assurances that we will be able to continue using the forests," he said. Consultation on the plans officially closed on Tuesday with a decision on a way forward expected in March or April.